I got my first laptop in November 2005. I like to joke that mine was, in fact, the last 15-inch PowerBook G4 that came off the assembly line before Apple stopped producing them and switched to Intel chips -- the last gasp of a nearly-extinct species. But while it's fun to make fun of my own bad timing with regard to technology, I don't really think I was all that unlucky. By November 2005, it seems to me that Apple had more or less perfected the craft of making PowerBooks. It was a really, really nice computer. I don't like to attach too much meaning to objects, but that laptop was special. Getting it marked my arrival in Portland and the beginning of a period of proper programming jobs instead of the CSS-grunt job I'd had in my first year and a half out of school. I had never owned a laptop before, much less a Mac. It was the shiniest and most expensive item I had ever purchased for myself, but it turned out to be absolutely worth it. After I started using it, I didn't even bother to power up my Gentoo box for two years. Not too long after I got the laptop, I was given a secondhand bike. I hadn't ridden a bike since I was a kid, and I started out tentatively pedaling around my neighborhood in southeast Portland, but eventually I was able to cover much of the city. The combination of having a laptop and a bike changed how I lived. Instead of working from home, I could work from anywhere. The Portland winters weren't warm, but they weren't as brutal as the Midwestern winters I was used to -- and having a warm PowerBook strapped onto my back made winter rides more pleasant. I still ride that bike nearly every day. Eventually, in January 2007, that company gave me a little white Intel MacBook, which I used until it was stolen from my house a year later along with two laptops that belonged to Paul stereotype441. The PowerBook was not among the stolen, and now I started using it for work again. It was slower than the MacBook had been, but otherwise, it worked great. And switching back was a breeze -- one svn up and I was good to go. My job eventually did give me a nice replacement laptop for my last four months with them, and I also overhauled that old Gentoo desktop machine, installed Ubuntu, and started using it again. But through all of this, the PowerBook -- which I had been using to make the podcast for years by this point -- continued to soldier on. It came to Japan with me in March, then to OSCON with me in July after I left my job. I thought about getting a new laptop for school, but why? The PowerBook was working fine. So it came to Bloomington with me in August, and I started using it more than ever. I did all of my homework with it. I traveled with it constantly. By the time spring came, it was out of warranty, it looked pretty clunky next to the newer laptops everyone else seemed to be carrying around, and I was always being offered power cables that didn't fit because my computer had the older, round power port design. But it kept working day in and day out. A couple of months ago, in March, I carelessly threw my bag on the floor, having forgotten that there was a computer inside it, and put a dent in the side of the three-and-a-half-year-old PowerBook. The damage turned out to be only cosmetic, and I was actually able to whack it back into shape myself, but I started to become nervous about being just one more careless moment away from not having a usable laptop, especially since the PowerBook was no longer under warranty. Alex oniugnip had asked a few times over the last year if I wanted a new laptop. I had hitherto resisted. But my birthday was coming, and the dent incident had scared me, and the new MacBook Pro was really, really shiny. So I asked, and he ordered one for me. It arrived via FedEx a few days before my birthday, and I was excited. But then, a strange thing happened: I didn't want to open the box. I suddenly felt embarrassed about having given in so quickly to the get-new-stuff! urge. I looked around and saw that not everyone had a newer laptop than me. I remembered how I had gotten by just fine in undergrad without a laptop, which was what some of my students were doing now, and I felt sheepish for ever having thought that the PowerBook wasn't enough. I even started to feel perversely proud of the PowerBook's clunkiness and proud of myself for using it, particularly for writing my compiler with it. (Who writes an x86-64 compiler on a three-and-a-half-year-old PowerPC machine? I do, thanks.) So it was a few weeks before I even unpacked the new laptop, and only then after much entreatment from Alex, who didn't understand why I didn't want to use my nice new laptop, which I had asked for, after all. I couldn't blame him -- I didn't understand, either. I made halfhearted excuses about not having time to move my stuff over to the laptop, but that wasn't really the reason at all. 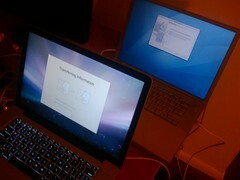 But he did finally convince me to open the box, if only to make sure that nothing was wrong with the new laptop. I unpacked it, powered it up, admired it briefly -- and then packed it right up again until the semester was over. Finally, on May 9, I unpacked it for the second time and transferred my stuff over to it, which ended up being a fast and easy process after all. I took off for Atlanta the following morning, and I've been happily using it every day. It's a state-of-the-art computer with all the bells and whistles. It's pretty much the nicest present anyone's ever given me. It's beautiful. But I think of my PowerBook, languishing back at home, and I feel a little unfaithful. It never did anything wrong! So I wrote this love letter. bookofpower, you've been with me through good times and bad. You've survived theft, international espionage travel, and dumb software jobs. You've been in and out of dozens of gray plastic bins. You've moved across the country with me. You've been dropped, spilled on, and pushed to the breaking point again and again. You've had dumb stickers affixed to you, and you've never complained. Thanks for being my first. gawm has been strongly hinting that I should be the first of us to replace my laptop. I, too, have a circa-2005 15" PPC PBG4. But I can't bring myself to do it. I don't want a new laptop. I want this one! Frankly, I don't like the newness of the new apple laptops, and their chiclet keyboards, and their intel inside. And I'm worried: my last two mac lappies have developed bad hinges at the three year mark, a flaw I consider too convenient to be coincidental. It's like the only moving part! So I'm being stubborn. I think I'll keep this one forever. Didn't the TiBooks have notoriously bad hinges? Yeah. The design is a break with the recent past, and it's a little ostentatious; the unibody enclosure looks really cool, but I'm not convinced it's as durable as they claim. After all, it's still got a separate screwed-on plate on the bottom. I do like the keyboard, though. The white MacBook that work gave me in 2007 had the same style of keyboard, and I would have been happy to keep using it if it hadn't been stolen. Yeah. The hinges on my TiBook siezed up solid. The hinge on my AlBook has gotten floppy, and seems to be pinching a vital wire/causing a short that causes random shutdowns among other symptoms. I'm very concerned about durability. I can't justify treating a laptop purchase as though I'm buying a consumable good. But that means I'm stuck, because by the time reliability is known, the manufacturers have all moved on to new designs. When I'm at home, I plug a bigger monitor and a separate keyboard and mouse into the PowerBook and use it without opening it, which is probably good for the life of the hinges and the keyboard. But I'm still opening and closing and carrying it around all day, so. Any tips for cleaning a PowerBook keyboard? Every now and then I just flip it over and violently whack it to get the gunk out, which can't be good for its innards. I'm nervous about removing the keys, though. I've never had to do any cleaning. I think an aircan blast would probably do it. My hinges fell apart and I held the thing together with gaff tape for a few weeks before eventually sending it away to MacResQ for a hinge replacement. 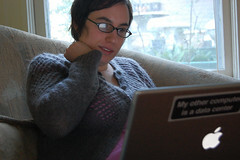 The pictures of Lindsey + PowerBook make this post awesome. A friend of mine still uses his 4 year old iBook because he loves it so much that he can't bear to part with it. Apparently, those things can run Leopard! I was shocked to find that out. My iBook died after a rough meeting with our concrete floors. :( I'm sorry for your loss. I bought my 15" PowerBook in January 2002. Sold for $750 in September 2006. Yeah, but that was because of all the fancy pro audio software you had on there, wasn't it? No. It was wiped completely. None of my software works anyway without a dongle, iLok and/or external sound card. Perhaps enough was NOT said. So I'll say it: That thing held onto its value like nobody's business. And an eBay bidding war ensued among people who loved the design of the TiBooks SO DAMN MUCH that they would rather have a creaky four-year-old computer than spend $200 more to get a BRAND NEW MacBook. Oh, man. I had always just assumed that the crazy-good resale value of your PowerBook was because it had Pro Tools or something! I got a new MacBook recently, here in Japan. It's pretty shiny. 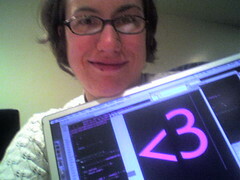 But I don't quite adore it as much as I adored my beautiful Inara Mac OSX Panther G3 PowerBook. It was really heavy but I looooooved it! But then, programs stopped updating because the programs were now written for the Intel chip, and downloads stopped working because... again, programs and applications intended for the Intel chip. Boo. I was sad. But I still have her. She's languishing under the kludgey monitor (because when I dropped my baby, the dent did damage, and she became reverse-blind --- just out of warrenty and production, boo). Ah, the PowerBook. A beautiful machine. This made me smile. I am afraid I will be this way when my current computer dies. I'm on my third laptop--I had a PC that was not-so-slowly dying the whole time I had it, and then a 12" PowerBook that I loved at first but which went through something like three batteries and three hard drives in the less than 3 years I was using it, which meant I was constantly scared of it dying, and I bought this one for myself when I graduated from college (normal black MacBook). I've had it for longer than the other three computers but don't feel that desire for something new that I had at this point with the others... I love this one. It was the center of my world when I dropped out of grad school #1 and moved to Florida, and it has been lucky enough to be my computer during a time when I was totally in awe of all the great things computers could do to organize my life. I can't replace it! Ever! I have a suspiciously similar computer in my basement -- I think Honor was 14" and bought in October 2005. I eventually gave in to the lure of being able to run Visual Studio at home, and now spend ~80% of my non-work computer use on the Windows side of this computer, but I still *like* both the Mac-ness and the command-line-goodness of it.